Available as a free .PDF e-book here and as a .EPUB e-book here. 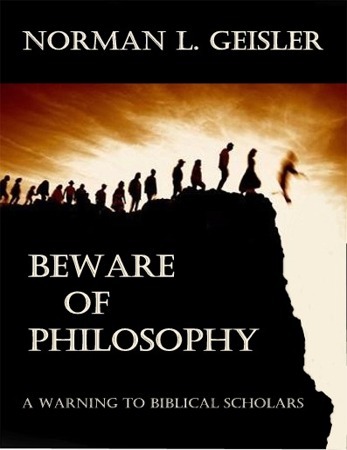 Beware of Philosophy began as the presidential address Dr. Geisler delivered to the biblical scholars at the 50th annual meeting of the Evangelical Theological Society (ETS) on November 19th, 1998. This eBook edition remains essentially the same but was updated slightly by Dr. Geisler in 2012. The exhortation of the apostle Paul to “beware of philosophy” (Col. 2:8) is as urgent today as it was in the first century, if not more so. And this is not only true for Christians who call themselves philosophers but for those who do not, especially for biblical exegetes. Although the context of Col. 2:8 probably has reference to a proto-gnostic type philosophy at Colossae that had a disastrous mix of legalism, asceticism, and mysticism with Christianity, the implications of Paul’s exhortation to “beware of philosophy” are appropriately applied to other alien systems of thought that have invaded Christianity down through the centuries since then. But before one can beware of philosophy, theologians must first be aware of philosophy. Dr. Geisler begins by explaining the sour theological fruit produced by the incursion of harmfulphilosophical roots. He warns against Naturalism, Spinoza, Hume, Bultmann, Agnosticism, Evolutionism, Progressivism, Existentialism, Phenomenology, Conventionalism, Processism, Platonic Allegorism, Ockhamistic Nominalism, Aristotelianism, Anthropological Monism, and Historical Criticism. He proceeds to offer helpful advice for the mind and for the soul–advice meant to help us avoid being influenced negatively by harmfulphilosophical trends and methods. This makes it a “must read”for all biblical scholars and for advanced students of God’s word! Add ask Kindle ebook only?PDF-Onlytoo small to be a print booklet?